This is a great time to consider your fall planting plans, and adding California native plants to your garden, Many attractive natives are extremely tough and drought tolerant once established. Unlike imported plants from other climes, most native plants are best transplanted in the fall, when they can count on some seasonal rain. Consider planting them for their wildlife value, which is considerable. Many native plant articles focus on the critical link between native plants and butterflies. Less often stated is the case for supporting the other less glamorous insects who provide essential nutritional sources for our nesting birds. Bringing Nature Home makes a compelling case for considering our gardens as wildlife refuges. The typical garden might hold camellias, roses and crape myrtles. 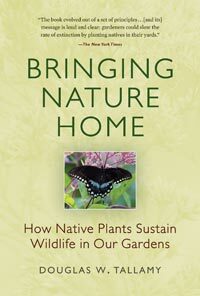 As Doug Tallamy’s book points out “That is beautiful, perhaps, but it's a barren wasteland to native insects and thus birds.” Most non-native imported plants were bred specifically to be unpalatable to insects, and most native insects are specialists who have evolved in partnership only with very few species of indigenous plants. So, in addition to our butterflies, we need to consider what else could be, and should be, living in our gardens. It’s harder to love a bug with a name like the "fly maggot", for instance, but it lives in the hard round galls often seen on the stems of goldenrod, and serves as an important food source to get chickadees through the winter. According to Professor Tallamy, almost all North American birds other than sea birds - 96 percent - feed their young with insects, which contain more protein than beef. Native plant habitat, for those insects and for the birds that depend upon them, is becoming less and less available, and the consequences have not been pretty.